Milk and other dairy products can be eaten daily without increased risk of cardiovascular disease and may even have a cardio-­protective effect. Analytical epidemiological studies suggest that the different saturated fatty acids (SFAs) found in dairy have different effects on serum lipid fractions. 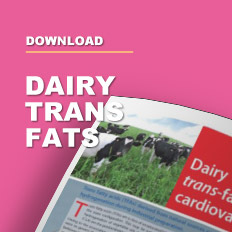 Furthermore, several recent systematic reviews and meta-­analyses fail to support previous studies that showed dairy to be associated with cardiovascular disease. 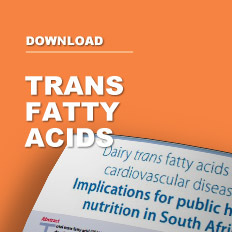 Many South Africans follow diets high in fat and SFAs and tend to exclude milk from their diet in pursuit of lower fat choices. 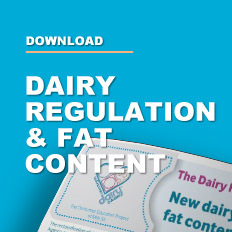 Dairy consumption is further compromised by the perception that regular consumption of these products is unhealthy, particularly owing to its saturated fat content. In contrast, some recent studies report beneficial effects of milk and dairy products with regard to cardiovascular health. The total SFA content of fresh full-­cream milk is 1.93 g and of low-­fat milk (2%) 1.30 g per 100 ml. Dairy products contribute relatively little to the SFA composition of the diet compared to other products of animal origin. · Dairy intake does not conclusively lead to coronary heart disease. A systematic review of prospective cohort studies found no consistent support for the notion that dairy consumption is associated with a higher risk of coronary heart disease. Mente also reported that insufficient evidence exist for an association between milk consumption and coronary heart disease after a systematic review of evidence that suggest a causal link between various dietary factors and coronary heart disease. Similar findings were reported by German, whose review on prospective cohort studies showed no association between dairy intake and cardiovascular disease in seven of the twelve cohorts. Three of the studies even reported positive relationships between dairy foods and cardiovascular disease. · Dairy consumption may reduce the risk of ischaemic heart disease and stroke. 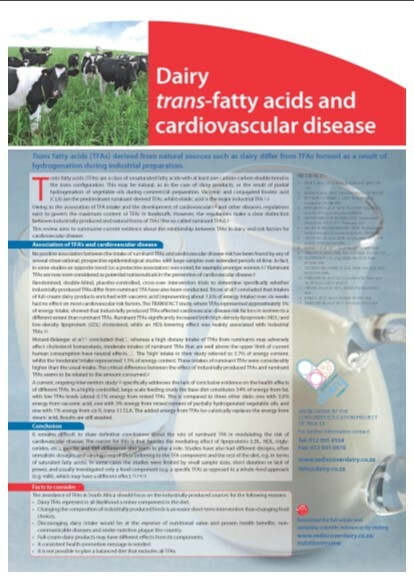 Two meta-­analyses of prospective studies on the consumption of milk and dairy foods and the incidence of vascular disease indicated an estimated 8% and 16% reduction in ischaemic heart disease and a 21% reduction in stroke events in subjects reported to consume the most milk, relative to those drinking the least milk within each cohort. · Milk fat is associated with a lower risk of first myocardial infarction (MI) and stroke. Warensjö investigated the association between serum milk fat bio-markers and a first MI and stroke. Milk fats were estimated by using plasma milk fat. Results showed that milk fat bio-markers were associated with a lower risk of developing a first MI and stroke, especially in women. Dairy products have a positive effect on non-­lipid cardiovascular disease risk factors such as blood pressure, inflammation, insulin resistance and type 2 diabetes, obesity and metabolic syndrome. Earlier reports of positive associations between SFA intake and the incidence of coronary heart disease led to the so ­called ‘cholesterol hypothesis’, which implies that all food containing SFAs of any kind increases the risk for cardiovascular disease. However, a recent meta-­analysis of well ­designed prospective epidemiological studies found no significant evidence for an association between dietary SFAs and increased risk of coronary heart disease, stroke or cardiovascular disease. Recent literature show no conclusive evidence for milk and other dairy as a food group being associated with increased risk for coronary heart disease. Dairy products in general, as well as their specific components, have furthermore been shown to have a positive effect on non-­lipid cardiovascular disease risk factors such as blood pressure, inflammation, insulin resistance and type 2 diabetes, obesity and metabolic syndrome. These findings suggest cardiovascular benefits of dairy foods that go beyond blood lipids. Milk and other dairy products can therefore be eaten every day as recommended by the South African Food Based Dietary Guidelines, without increased risk of cardiovascular disease and possibly even fulfilling a cardio­-protective role. 1. Kris­Etherton PM & Innis S. 2007. J Am Diet Assoc. 107: 1599­1611. 2. German JB et al. 2009. Eur J Nutr. 48: 191­203. 3. Wolmarans PW & Oostehuizen W. 2001. SAJCN. 14(3): S48­55. 4. Elwood P. 2001. J Epidemiol Community Health. 55: 375. 5. Elwood PC et al. 2010. Lipids. 45(10): 925–939. 6. Mensink RP et al. 2003. Am J Clin Nutr. 77: 1146­1155. 7. Langenhoven M et al. 1991. South African food composition tables. 3rd ed. Medical Research Council. Cape Town. 8. Siri­Tarino PW et al. 2010. Am J Clin Nutr. 91: 535­546. 9. Gibson RA et al. 2009. Br J Nutr. 102: 1267­1275. 10. Mente A et al. 2009. Arch Int Med. 169(7): 659­669. 11. Warensjö E et al. 2010. Am J Clin Nutr. 92: 194­202. 12. Warensjö E et al. 2009. Nutr J. 8: 21. doi: 10.1186/1475­2891­8­21. 13. Lamarche B. 2008. J Am Coll Nutr. 27(6): 741S­746S.